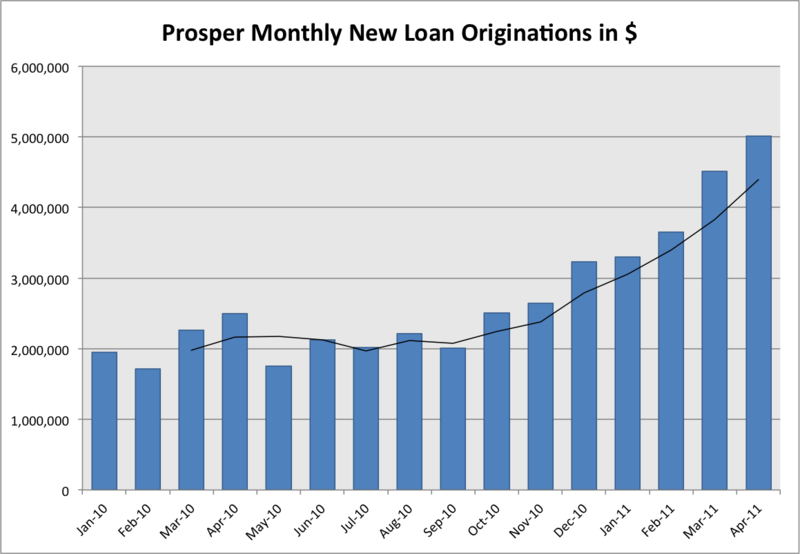 The numbers are in for April and it was another great month for Lending Club and Prosper. 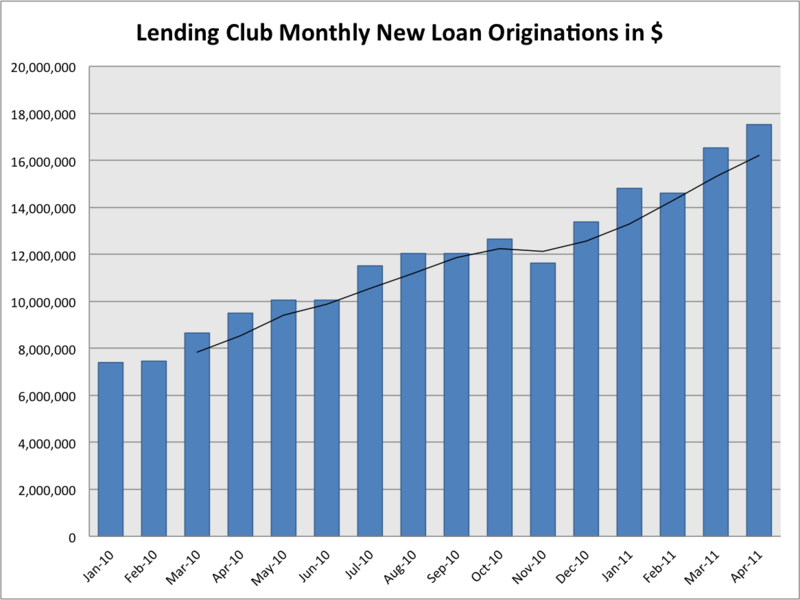 For Lending Club it was another record month, with $17.5 million in new loans issued. The last day of the month provided the usual bump with just over $4 million in new loans issued on April 29. This is the fourth time in five months that Lending Club has had a record month and the growth rate seems to be accelerating as you can see in the chart below. For Prosper the news was also very good. They broke $5 million in new loans for the first time since they reopened in July 2009 after their SEC imposed quiet period. They are maintaining their rapid growth curve that really began after they changed their lending model in December. In just three months Prosper has increased their loan volume more than 50%, as you can see from the steepening of the black three month rolling average curve in the chart below. This is great to see. My biggest fear with P2P lending is that the platform itself would go belly up. Do you have any idea how much business Prosper and Lending Club have to do in order to break even? I thought it was in the neighborhood of 50,000,000/month, but I don’t remember where that number came from. @Carl, I have been told that it is in the neighborhood of $25MM – $30MM a month. If Lending Club keep up this growth rate they should reach those numbers by the end of the year. It will be great for the industry when someone gets cash flow positive. I have no doubt that Lending Club will be doing over $25 million by years end but I’m thinking the break even number is over $40 million monthly or $0.5 billion annually. @Peter, If those numbers are true, then with ~4% origination fees and the 1% borrower repayment fee, Lending club will need around $18-20 million in revenues to get the $30MM break even. Is that right? It seems a bit high to me for a company that is exclusively online. Than again, I have no idea of what Lending Club’s expenses are. I’ll quickly take a look. With Dan’s numbers it would be around $25 million in revenues. I just took a look at LC’s Prospectus for Jan. 7, 2011. It states that Lending Club has 51 full time employees. That would make $400,000 in revenues for each employee. Nice. On page II-95 of their prospectus it says that their SEC legal and acounting expenses amount to just short of $4 mil per year. I also looked up LC’s operating expenses on their Form 10-K for FY 2010 which ended in March ’10. It states on page 51 that Lending Club’s operation expenses are just above $11 mil. Assuming a generous 5% increase on both expenses, that would amount to just short of $16 million in revenues this year to break even. What is that in loans per month? That would amount to roughly $26 mil in new originations per month. Peter’s numbers are appear to be fairly accurate. Totally possible by the end of the year at this rate of increase. We will see if they can keep it up. @Aaron……..I don’t believe the origination fees “average” 4%. The last time I checked 4% was at the top of a 2-4% scale, so I’m assuming that 3% would be a better figure to work the numbers with. @Dan, They must have raised their fees. It says there that the origination fees range from 2-5%, but you have to be in the A grade to get 2-3%. 36 mo Bs get 4% and everyone else gets 5%. With this in mind I figured that 4% was a fairly conservative estimate. @Aaron……….Yeah, these rates are definitely higher than the ones I recall seeing. So yes, clearly what you say makes perfect sense. Interesting responses. Seems Prosper will be years away from profitability unless their upward trend grows significantly. That said, Peter alluded awhile ago that institutional investors jumping into the fray. That could quickly raise the amount funded and increase the p2p validity to a larger audience. The next 6 months results should be very telling. I’ve only been following Prosper for a few months but it seems like there’s a real divergence in terms of the type of borrower that LC & Prosper are getting. The average loan amounts appear to be widening between the 2. Obviously it’s at least partly due to the recent increase to $35k max amount on loans at LC but does anyone know if this has been an ongoing trend going back into the past? From their last 10-Q in the 4th qtr of 2010 they had revenue of around $1.6million. With borrower originations in that quarter around $37.5 million this gives us $1.4 million in revenue for the quarter. There was around $20 million in borrower payments (give or take a million) in the 4th quarter (obtained from the download files) which would have added a further $200K in revenue for the $1.6 million total. If we double those numbers we are at $25 million a month for the quarter and total revenue would be around $3.2 million. But expenses in Q4 were $4.5 million, so that still leaves a gap. Triple the numbers and you are getting close to breakeven on current expenses. But presumably if you triple the numbers expenses will go up. So, Dan may well be right on the $40 million a month number. The big unknown is sales & marketing expenses. I have been told that these will come down (there are fewer promotions for investors these days) in which case the $25 – $30 million numbers may be accurate. A lot will be learned when they release the numbers for Q1 2011. @Bilgefisher, Prosper will be a lot further away unless something dramatic happens. They have claimed breakeven next year but they will need some very rapid growth before that happens. @Dan, Prosper’s average loan size is also going up but not by nearly as much as Lending Club’s. One day I will do a full analysis of this and put in the blog. I think that ultimately it’s a matter of whether there’s light at the end of the tunnel. With LC we can all see that light, I think. With Prosper I’m not sure. I must admit that I was surprised as to how quickly their loan numbers recovered after the change in format back in December 2010. Now let’s see if they can get new money in the door quickly as well. Still…………outside of the blogs, I’ve yet to speak to anyone who has ever heard of Lending Club or Prosper as an investment or a place to get a loan. Partially that’s a comment on the people I associate with outside of the blogs 🙂 ……………but there’s probably a lot of work to be done on publicizing as well. @Dan, That is a good point. Now, that I am pretty much a full time blogger in this area I have shared what I do with probably about 100 people in the last six months. Of those, I can think of two people who had heard of Lending Club and/or Prosper. Clearly ignorance is still one of the biggest hurdles facing the industry. It will be fascinating to see how everything plays out with Prosper. They are certainly going for a higher risk borrower than Lending Club on average but their results recently have been very promising. The key for them, assuming they have more VC funding in order, is to maintain low default rates. This is what almost killed them in their first incarnation and I know many investors on the sidelines watching to see what will happen with Prosper 2.0. @Peter, Yeah, I was using FY 2010’s 10-K data. I took a look at to 10-Q that you posted and found the major flaw in the numbers. You are right about the sales and marketing being the major factor. When I used the 10-K data, I had accounted for a 5% increase in all operating expenses across the board. I was pretty close according to the 10-Q data in all areas except for the sales/marketing/customer service category. I really did not expect it to MORE THAN DOUBLE. If they get this cost down, then we may see profitability soon. If they continue to spend on this at the current (as of Dec ’10) rate, we may need to wait another year. @Dan, To tell you the truth, I don’t know anyone else who knows about these sites either. I’ve mentioned it a few times as an investment vehicle, but unfortunately I find it hard to recommend a loan servicer that takes 4% right off the top on a loan when you can get a 9% unsecured loan without ANY fees at any local credit union. As to your question, Prosper has been getting much more $$$ per loan they service. This has been going on since they kicked their auction model last December. This has been happening mainly due to there being more money waiting for invesetment on the site than creditworthy borrowers. You can see that trend on Peter’s chart above. Getting back to the issue of P2P name recognition, apparently some borrowers using Lending Club aren’t even aware of them. I remember seeing more than one listing that thanked Lending Tree for the opportunity to borrow. From my perspective, P2P lending is well below the radar screen of the average investor/borrower. Regarding the long term viability of these companies, much will depend on the overall interest-rate environment and stock market returns, and the emergence of a true picture of default rates as the loans mature. @Aaron, I think we will find that the sales & marketing number has dropped a bit – mainly because there have been few investor incentives so far this year. For a while there I think they really needed to get more investors on board but that doesn’t seem to be as much of an issue any more. @Mike, I have seen the Lending Club/Lending Tree mistake come up as well. Personally, I think Lending Club is not the best name (for that reason), they have to work harder at branding than they otherwise would. If the growth keeps happening and the returns stay strong for investors, eventually the mainstream media are going to pick it up as a worthwhile asset class for the average investor. But we are probably several years away realistically from that happening. If Prosper does indeed have more investors than borrowers these days then I’m curious as to the reasoning behind the 3-4% featured listing bonus that they seem to be running every other weekend. @Dan, Good point. Based on all the investor bonuses they have going on right now, I would say Prosper has a shortage of investors. Although that certainly wasn’t the case three or four months ago. I am a new Lending Club investor (12-2010) and just discovered your blog site. I have been interviewing financial advisers on peer to peer lending and I do not believe peer to peer lending will ever truly be promoted from this sector. They tend to snicker and tell me to take care playing my little money game. I will be looking further for an adviser. I consider this a satellite investment and will enjoy my little money game. I enjoy reading your comments about this business. Thanks. @Dave, Welcome and thanks for joining the conversation. I wouldn’t say that p2p lending will never be promoted by financial advisors but lacking any commission based product many advisors will steer clear on principal. That will change I believe. Lending Club is already seeing great interest from institutional investors and this will only increase as more people find out about the great returns that can be achieved. Hi, I have been investing with LC for a bit over 8 months now. At this time I have over 600 loans total. My main problem now is how to manage cash flow in the investment, logically. If this investment is growing by, say, 9% (I think it is doing a bit better), and if I were to pull out 20% of profit/month I am not sure where I would put that cash at this point. If I keep reinvesting in LC the cash flow keeps growing…but to what end. Should I target a specific cash flow with a specific return and pull out a percentage above that and use it for living expenses…any thoughts? @Yosef, You have hit on an excellent point and one that I will be covering in an upcoming blog post. Most people use this money as a long term investment so they just reinvest everything. But it doesn’t need to be that way. You could certainly take out a portion each month and reinvest the rest. Personally, unless you are retired I think you should be reinvesting your returns. So, if you are still earning an income then I would say don’t take anything out – just reinvest everything. If you are retired then…stay tuned. I will be dealing with that in an upcoming post.